ACC preview: Can anyone catch Duke and its impressive freshman class? ACC 2017-18 Preview: Can anyone catch Duke and its impressive freshman class? Duke's recruiting has set it apart from the ACC pack, though the conference is once again full of Top 25 teams. It’s been a busy few years for the Atlantic Coast Conference on the basketball court. The ACC is home to two of the last three national champions, and has had at least one national semifinalist in three straight seasons. A record six ACC teams made the 2016 Sweet 16, and the league has earned over $100 million for its recent NCAA Tournament success. This past March, Brooklyn played home to the conference’s postseason tournament for the first time, vaulting the ACC to center stage in New York City. But off the court, the league has also garnered the wrong type of attention, too. Syracuse and Louisville have issued self-imposed postseason bans in the last two years following NCAA issues. North Carolina’s been served several notices of allegations for its own academic scandal that’s still yet to be resolved. And in late September, it was revealed that Louisville and Miami are under FBI investigation for their respective roles in a pay-for-play scandal. It’s already resulted in Louisville athletic director Tom Jurich and men’s basketball coach Rick Pitino both getting fired. There could still be more fallout to come. That’s the backdrop for the history-fueled league in 2017-18. Once again, the ACC brings at least a couple title contenders to the table. Now we wait to see if those programs can live up amidst a rising tide of scrutiny for some of the conference’s top names. 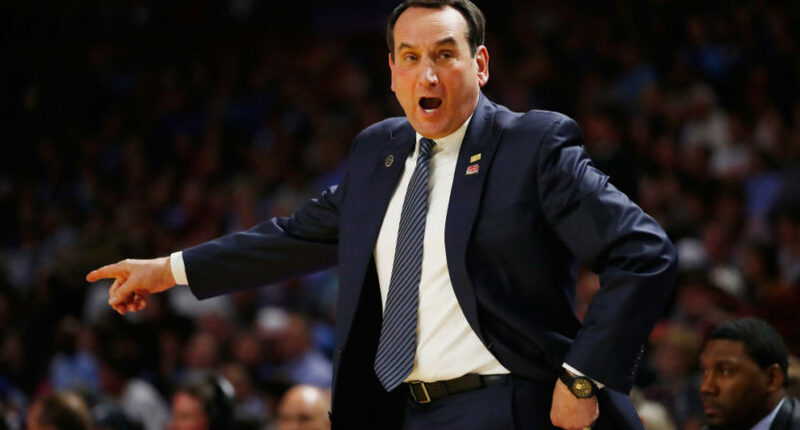 Blue Devils coach Mike Krzyzewski has beaten the one-and-done programs at their own game in recent seasons, balancing a mix of four-year players and instant NBA talents for years now. The 2017 class was no exception, as the already strong group was bolstered late by power forward Marvin Bagley III, who reclassified in August to become the nation’s top prospect. With the top class in the country yet again, Duke will be reloading on the fly while replacing standouts like Jayson Tatum, Luke Kennard and Amile Jefferson. Between the freshmen, senior Grayson Allen and a cast of blue-chip contributors returning from last year, the Blue Devils may even be able to improve on 2016-17’s effort. What will Louisville look like without Rick Pitino? With the Hall of Fame coach gone, former player David Padgett takes over as interim head coach for a Cardinals program that is both talented and reeling right now from what’s been a tumultuous few years off the court. Given Padgett’s familiarity with what Pitino wanted this team to do, it’s unlikely much of the system changes. But the on-the-court product is likely to take a hit as the stress of the NCAA issues hang over this program. Louisville will also be replacing last year’s top performer, Donovan Mitchell. The Cards could either enter this season incredibly motivated, or completely defeated from day one. Life in the ACC means one of the sport’s top programs looking to repeat as national champs is not even the league’s top story. North Carolina is without some of its best contributors from the Final Four teams, including Tony Bradley, Isaiah Hicks, Justin Jackson and Kennedy Meeks, who all departed this offseason. That said, Joey Berry II and Theo Pinson do return, bringing a combined 20 points, seven boards and seven assists per game between them. And they add Pitt transfer Cameron Johnson (who’s coming off a season averaging 12 points and four boards, plus 41.7-percent shooting from three) to that mix as well. And what of Miami’s own potential issues with the FBI and NCAA? Louisville received most of the headlines in the immediate aftermath of late September’s pay-for-play news. However, Miami was also involved — though to what extent is still being sorted out. While that’s all happening, the Hurricanes return six of their top eight scorers from last year and look like a legitimate ACC and Final Four contender. Miami’s built something very interesting under Jim Larranaga these past few seasons. If they can weather the off-the-court storm, this group could be the best basketball team the school’s ever had. John Cassillo covers all things Syracuse sports (and beer) as managing editor of Troy Nunes Is An Absolute Magician. An SU alum, he hasn't missed an Orange football game since 2006, despite his better judgment. John lives in the Los Angeles area with his wife, and his dog who's named after Jim Boeheim.